Another great season is almost off… 2007 has allowed you to drive whether you are an amateur or a pro. However for us at Stand 21 it is not over yet. 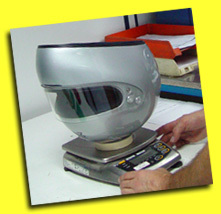 In this newsletter, you will see our brand new products for 2008, results of a long R&D process and your precious help. 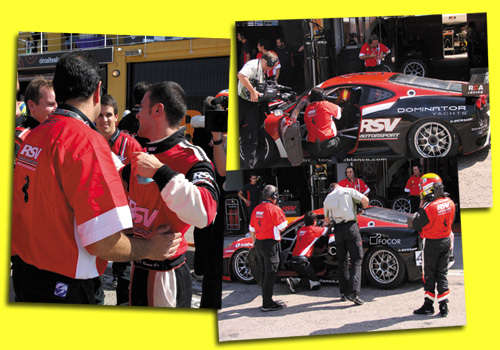 Our partnership with PORSCHE MOTORSPORT has been a world success. Today, we bring you the PORSCHE MARTINI RACING collection remembering the legendary partnership between PORSCHE and MARTINI. We are also glad to add STAND 21 CALIFORNIA (Stand 21 France subsidiary) to our network, allowing us to be on the U.S. West Coast, more precisely in Los Angeles. Lastly, 2008 will be the opportunity to see our new catalog and to visit our updated website! A world exclusive: the 1st Air Force racing suit, FIA 8856-2000 homologated! 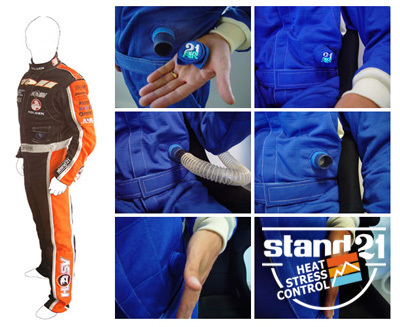 By simply injecting fresh air inside the suit, your body stays cool, avoiding Heat Stress and fainting. Stand 21 made its first Air Force racing suit in 1986 with Al Unser Jr., winner of the prestigious Indy 500. Then, Stand 21 improved the principle in 1994 with the McLaren GTR and today homologates it for your use. 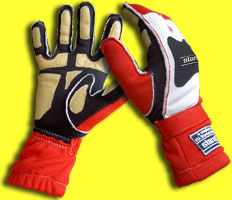 New FIA 8856-2000 Outside Seams gloves… In stock now! They benefit from the principle invented by Stand 21 in 1985 alongside Ayrton SENNA: sewing the seams on the outside optimizes your driving movement and comfort and minimizes irritation. IVOS… Available 1st semester 2008! 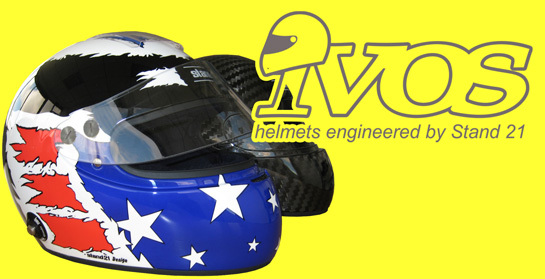 The new helmet IVOS (Innovative Vision & Optimum Safety) is coming. This helmet is the first one built exclusively around the HANS® System thanks to its innovative design and its high technology. As light as a feather (from 1,190 gr to 1,290 gr depending on the size), it was outstanding during the SNELL SA 2005 tests. Furthermore, it has been elaborated inside a wind tunnel for optimum stability in open cars and has an enlarged lateral visual field. Be careful! The manufacture of IVOS will be limited to 500 copies for 2008. Feel free to contact your Stand 21 technical advisor to check if your helmet respects the proper standards! 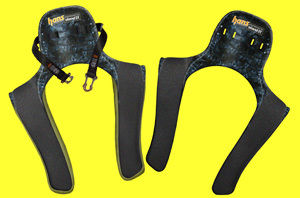 New HANS® System: a revolution affordable to everyone! 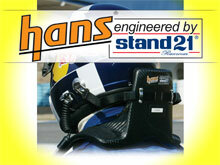 Now, the HANS® System is worn by many drivers, even amateurs in every series! It saves lives! Find our complete HANS® Systems range, FIA 8856-2002 homologated, here. 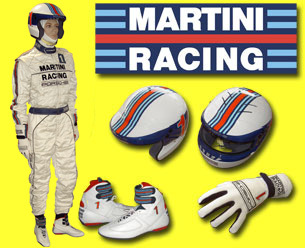 Porsche-Martini Racing collection and relive the legend! You thought it was impossible… Stand 21 makes it for you! by customizing your equipment as well as your teamwear from head to toe! Test your imagination by clicking below! from December 6th to 8th, 2007, in Orlando, Florida. 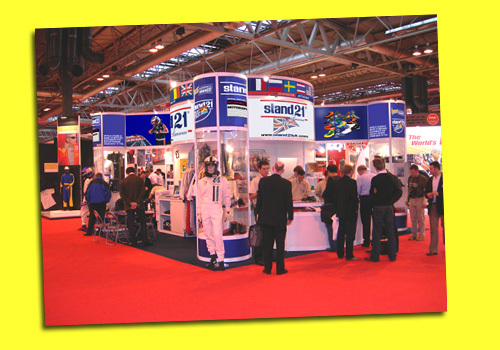 (hall n°9, stand n°9420) from January 10th to 13th, 2008. Contact one of our Stand 21 advisors here! COME TO FIND OUT, TEST AND APPRECIATE OUR KNOW-HOW! 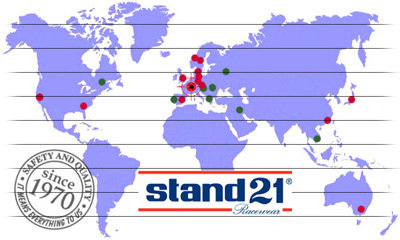 Stand 21 travels all around the world all year long to meet you! The trackside service calendar is available here. Our made-to-measure helmets and racing suits manufacturing factory based in France is growing to optimize your orders within the best leading times! Contact us and visit our new factory! 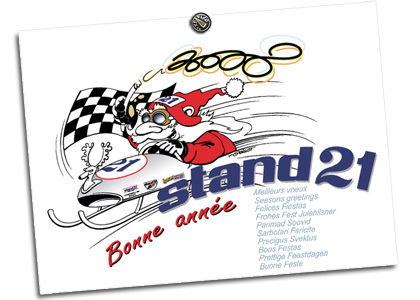 STAND 21 THANKS ALL DRIVERS AND TEAMS USING STAND 21 PRODUCTS ALL OVER THE WORLD! Do you like this newsletter? Put a friend's name down to share those information!